Since school's been in full gear for the kids all I've been thinking about is the next holiday to come up. I want to do all of these fun things, but have been sick pretty much all month and have been slacking a bit. Or maybe a lot! We managed to sew one Halloween pillowcase and worked the left over bits into two Trick-or-Treat bags. I bought one of those big cheap drop cloth paint tarps at Home Depot and have been cutting into it for a lot of projects like these. Not as smooth a lovely linen (I save that for the extra pretty projects!) but good enough for the boys. 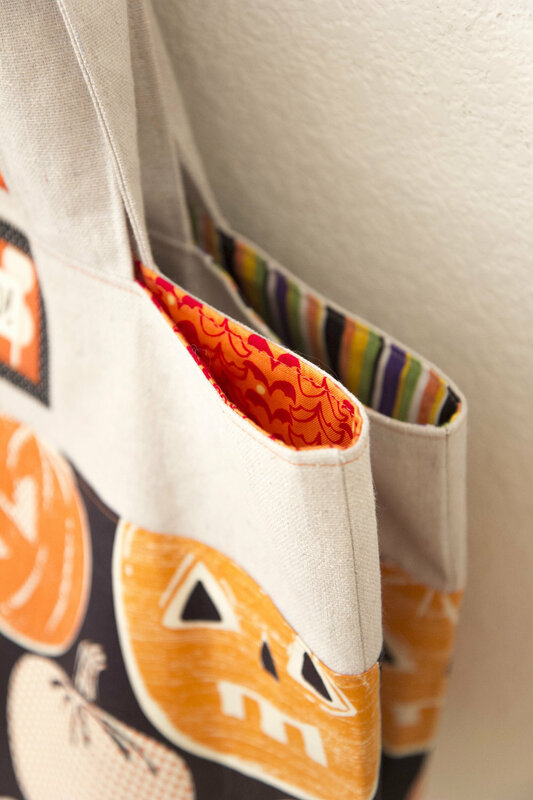 There was also just enough left over Halloween fabric from last year's Halloween quilt to line the bags, the binding and the backing fabrics. I think I should've made the bags a little bit smaller, but considering how much candy my siblings and I used to score... we need lots of room for lots of candy boys. Plan on sharing with your mom, right? Plus, it's nice to for them to be able to hold a water bottle, and a flash light in their bags easily. I wish I could've gotten this embroidery pattern up sooner in the month in October, but it just didn't happen. :( It can always be used for a project next year thought, right?? 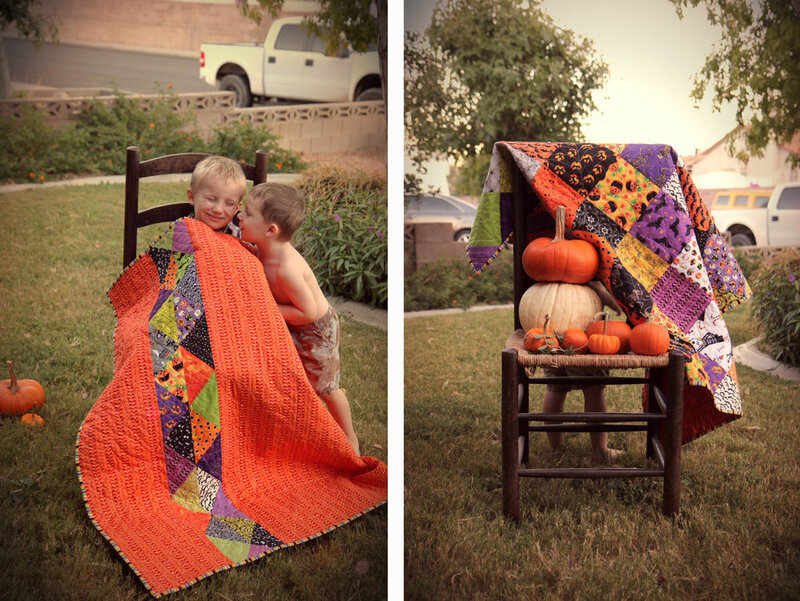 There's two bonus patterns included for fun: a bat, and sweet Jack-O-Lantern. Link to download it is at the bottom of the post. Alas, there were only 3 trick or treaters that came to our house. Which sucked. I had a whole bunch of candy I wanted to hand out. Plus, those 3 trick or treaters came in one group. :( It seemed like people in this gated community drive their kids to other neighborhoods to trick or treat (Which we ended up doing for our boys, it was dead outside sadly!). They seemed to have fun though, which is what always matters. ^_^ I only got a quick phone picture of them before they were out. Jacob's ninja costume was made from an old black t-shirt. Jude's...well, he was Thomas the Train for the 4th year in a row... I've made that train costume 3 times too many. Maybe next year he'll give me something different to work with finally lol! Sorry for the ~Month+~ Long Hiatus!